Unhappy Holidays? Focus on the “Stuff” that Matters – Travel. Garden. Eat. ‘Tis the season for Martha Stewart-esque images of perfectly decorated homes, elaborate craft ideas shared on Pinterest, and a pervasive pressure to create the ideal holiday memory for your family. Has the holiday to-do list already grown three heads and taken over your life as we countdown to Christmas over the next 30 days? Have you asked yourself why you are doing each task and who really cares about it? Not knocking it, as I certainly enjoy hauling down my bins of holiday decor, putting on the Christmas tunes, bringing in the fresh Christmas tree that fills the house with a wonderful aroma of pine, and fa-la-la’ing for an evening as the house is transformed into holiday central. But, if I don’t watch myself, I certainly can turn into the monster with at least two heads at various points of the season, as “mom the martyr” emerges when the other members of the family (coincidentally, all other members of my household being of the testosterone variety) fail to get as giddy about some of the traditions as I do. 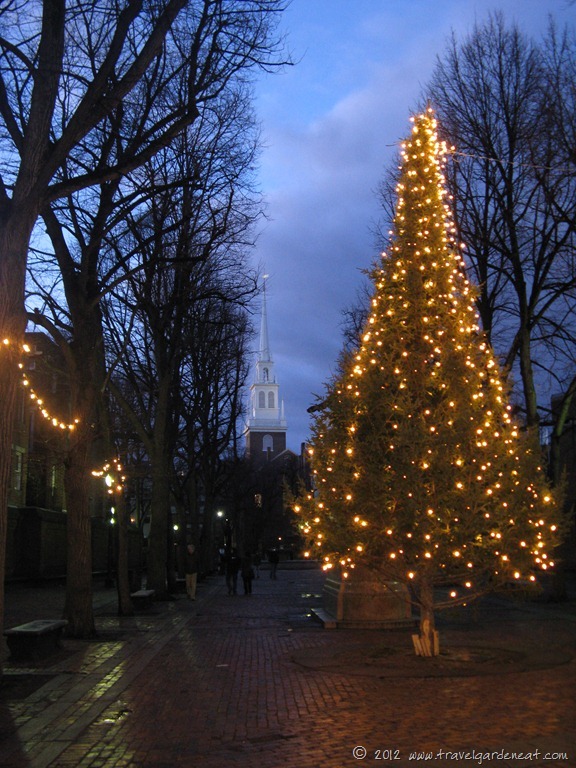 From a Christmas we enjoyed away from the traditions of home ~ a serene evening scene in Boston’s Revere Park with Old North Church in the background. 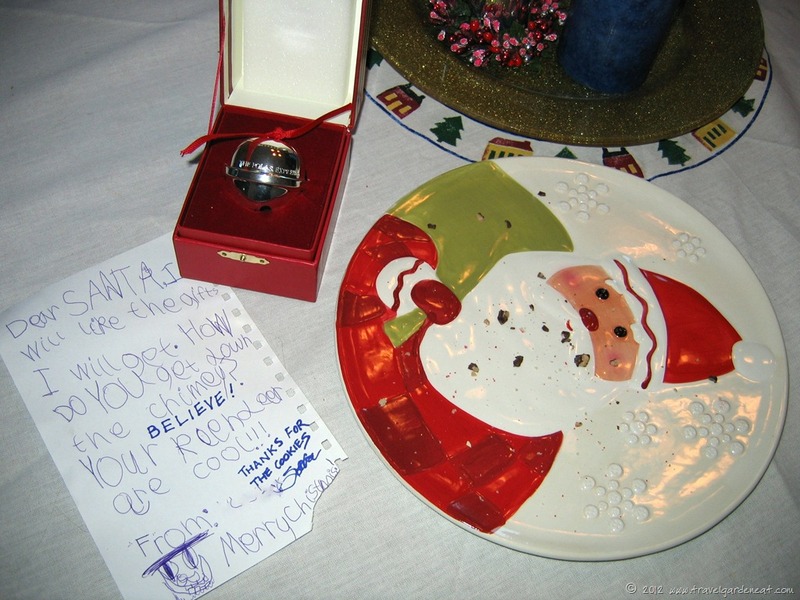 Over time, I have tried to let go of that disappointment and modify expectations, which provides for a much happier household all season long. Some things I do for myself and the pleasure I get from them, and that is enough. By letting go of expectations and “must do” traditions occasionally, though, sometimes the most delightful doors open to new traditions and experiences. As John Lennon said, “Life is what happens to you while you’re busy making other plans.” Don’t let those plans and to-do lists overshadow the potential happiness of the holiday season — it can be such a special time, and there is a certain magic in the air if we open ourselves to it. 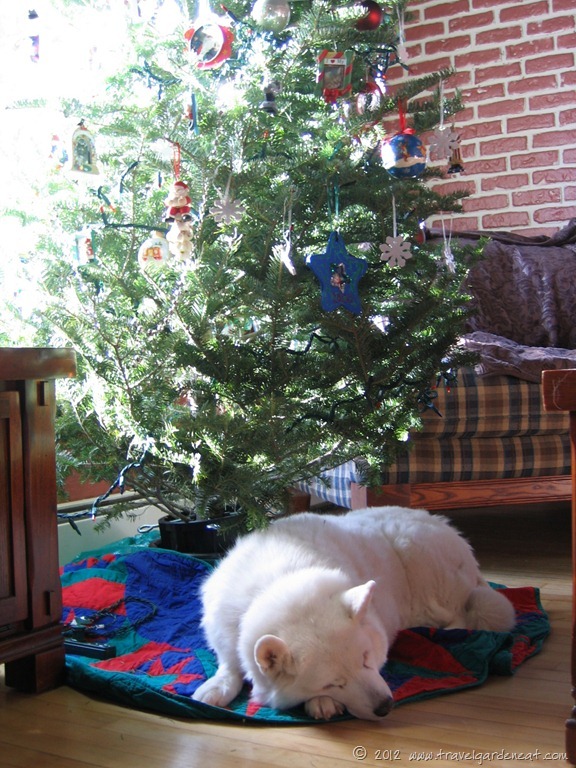 A special present remained under the tree . . . notice the lack of ornaments on the lower part of the tree (life with two cats). Be mindful of the things that matter during this holiday season. If you fall off the happy wagon (I can assure you that I do at least once a day, just ask my husband and my teens . . . ), brush yourself off and hop back on (knowing you are not alone in these seasonal “bah, humbug” moments). If you overindulged, rather than depriving yourself of the enjoyment or beating yourself up with guilt, simply hit the reset button, go for a nice long walk or run to help balance things out if you are able to do so, or start anew in whatever way you can (so says the blogger who ate way too much cheesecake this weekend). If you are facing a goal or burden that seems overwhelming, and many days are two steps forward, one step back, then think of Arthur and his transformation, and take each day as it comes, one at a time. Dear Santa . . . I will like the gifts I will get . . . The Grinch was wise indeed in recognizing that the true meaning of the holiday season comes from focusing on the “stuff” that matters — and that many gifts come already opened. Isn’t that true of life throughout the year? Thank you Kat for the reminders about the joys of the holiday season – the trick will be to keep the focus on the joys rather than the “bah humbug” tendencies in the midst of all the frenzy and the bombardment of messages about “stuff” and “expectations.” Re-reading inspiring posts like yours and watching inspiring videos about people like Arthur definitely help. My house is ready for the holidays, I’m scheduled for shopping on Dec. 8., I got a 2 reunions, 3 kiddie birthday parties, 2 adult birthday parties, 3 baptismal (I’m the godfather), 4 weddings (one of which I’m the emcee) and 7 Christmas parties to attend to all within the month of December. And, yes all of them matters but just the thought of all these makes me wanna just get lost ! 😦 I will do my best to be happy 🙂 Thank you for this. You wrote exactly what I needed to hear, Kat. I’m hitting my reset button right now. I need to hit that reset button multiple times on some days! A timely message. Coincidentally, I shared Arthur’s story on FB on this morning. It is indeed inspirational. That video is amazing! Cured me of all my complains of the day in a fraction of a second. Thanks for sharing it! People must be reminded that some fall victim of depression from this glorious, “joyous” holidays, that not all people get to celebrate it (the way they want it to). So true, people should not get their heads so fixated with the chores and as you put it holiday “expectations”. They need not to forget to look around. Then, perhaps that can be enough, when they start to compare what they have from what they saw after looking at others that they can be merry. Very nice, Kat. Great pictures, and the video was really inspiring. Thanks for sharing it. This is an inspiring post and I like the part of that we gifts in our life that are already unwrapped. During the holiday season some cannot celebrate as picturesque as those portrayed in Martha Stewart which can be a reminder to be thankful for what is in our lives right now.